2012 has been a good year for Gregg Allman. The Allman Brothers received a Grammy Lifetime Achievement Award, plus he published his autobiography, My Cross To Bear. To capitalize on those milestones, Cherry Red Films will release a somewhat odd DVD on December 11, 2012 that contains some good music. The title of the DVD, I’m No Angel: Live On Stage, gives the impression that it was a performance of his 1986 iconic album of the same name. The music was taken from a November 1988 concert at The Cannery in Nashville, Tennessee. That particular tour was in support of his Just Before the Bullets Fly album. Thus four of the tracks are from that release, with only three from the album advertised in the title. It was also a short performance of just under an hour. He was the opening act for Stevie Ray Vaughan, so his set was adjusted to reflect that fact. The good news is that there is some very good music contained on the DVD. His solo career began shortly after his brother Duane’s death and while he continued to perform and record with The Allman Brothers, by 1988 his solo act had been honed and he had accumulated a good catalogue of his own music. His backing band of guitarist Dan Toler, drummer Dave Toler, bassist Bruce Waibel, keyboardist Tim Heding, and percussionist Charles Trippy had backed him in the studio and were tight on stage. Three songs are from the album I’m No Angel. “Don’t Want You No More,” “It’s My Cross to Bear,” and especially the title track are more raw and stark than their studio counterparts. Four tracks are from Just before the Bullets Fly. The title track, “Demons,” “Fear of Falling,” and “Slip Away,” show just what a good musician and vocalist Gregg Allman was live on stage. The highlight of the concert was the old blues classic, “Statesboro Blues,” which was a part of the Allman Brothers repertoire. It may not have the guitar power of the original but it was a wonderfully gritty version of the old Blind Willie McTell tune from the 1920s. The sound is excellent as the various instruments and vocals are clear and distinct. The camera angles are limited and the picture quality is average. It was probably another one of those concerts that was not meant for general release at the time, so the recording process was haphazard. I’m No Angel: Live On Stage may not be the definitive Gregg Allman concert experience as the song selection is a bit dated and the performance is short. Still, what is present is a fine introduction to his solo career. Article first published as Music DVD Review: Gregg Allman – I’m No Angel: Live On Stage on Blogcritics. All careers have to start somewhere. Before Duane and Gregg Allman formed the Allman Brothers, they were a part of the Allman Joys and Hour Glass. Both bands reveived little commercial success but they set the tone for what was to follow. The Hour Glass were formed during 1967 by Gregg and Duane Allman plus keyboardist Paul Hornsby, drummer Johnny Sandlin, and bassist Pete Carr. They opened for such bands as The Doors and The Buffalo Springfield. Their debut single was “Nothing But Tears,” which received no chart action whatsoever. 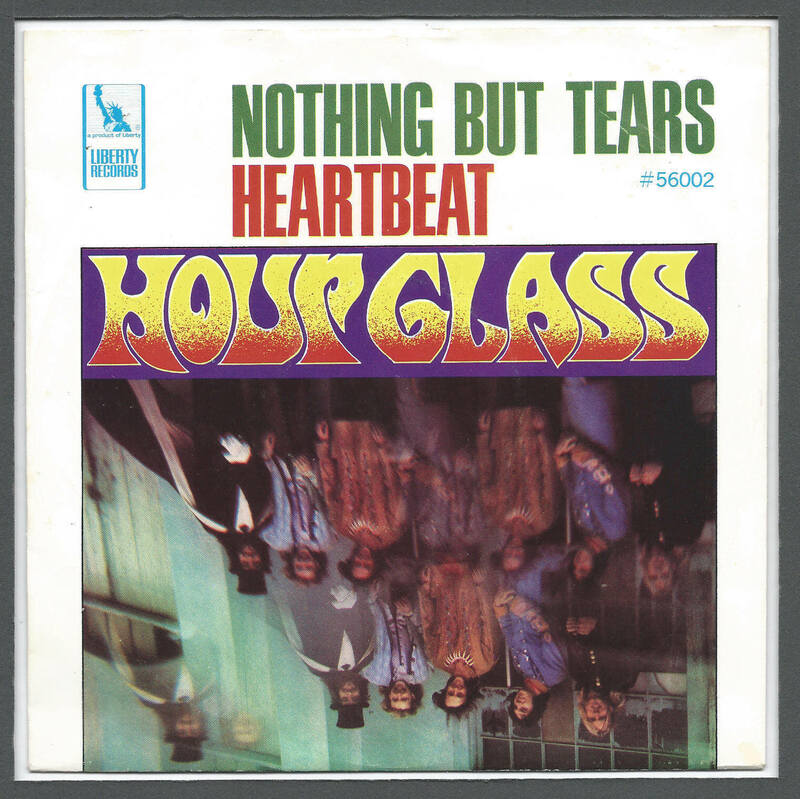 Hour Glass was more of a psychedelic rock band than the future Allman Brothers. The picture sleeve remains an excellent relic of the psychedelic era. One Way Out is a two disc live album released by The Allman Brothers on March 23, 2004. It was recorded during a two night stand at the Beacon Theatre in New York City, March 25-26, 2003. It is the first live album to feature current guitarists Derek Truck and Warren Haynes together. It is also the last Allman Brothers album to date. The album is a chronicle of the band’s career as both old and new material is included. The songs are both tight and loose extended jams, with five of the tracks clocking in at over tem minutes and two more falling just short of that mark. While Derek Trucks and Warren Haynes will always be compared to Duane Allman and Dickey Betts, they need to be evaluated on their own terms. When that happens, they emerge as one of the finer guitar combinations working together today. I also like the fact that Trucks’ guitar comes out of the left speaker and Haynes’ from the right. The four man rhythm section of drummers Jaimoe and Butch Trucks, percussionist Marc Quinones, and bassist Oteil Burbridge are one of the best in the business. When you add in Trucks, Haynes, and keyboardist/vocalist Gregg Allman, you have a solid unit of seven excellent musicians. The Allman Brothers, whether their classic Duane Allman lineup or their 21st century aggregation, have always been more adept live than in the studio. The Allman Brothers are one of the great survival stories in rock history, as they have overcome death, addictions, and personnel changes. Their current group may not have the finesse as that of their classic predecessors, but they are probably more powerful. It’s been seven years since their last release, so it’s about time for another. The Allman Brothers released Hittin’ The Note, March 18, 2003. It was their first studio album in nearly nine years and a lot had changed for the band. Guitarist Warren Haynes and bassist Allen Woody had left to form Gov’t Mule. They were replaced by bassist Otiel Burbridge and guitarist Derek Trucks. Next, Dickey Betts was fired from the band he helped to form. Allen Woody passed away and Haynes decided to rejoin the band. Finally they added conga player Marc Quinones as a third percussionist. If your keeping track, The Allman Brothers now consisted of Haynes, Trucks, Burbridge, Quinones plus original members, keyboardist/vocalist Gregg Allman and drummers Jai Johnny Johanson and Butch Trucks. Allman and Haynes were now the dominant members of the band and they formed a surprisingly adept songwriting combination and here they co-wrote five of the eleven tracks. Allman’s voice is in fine form and his keyboards are more front and center than in the past. Haynes co-wrote an additional 3 tracks with other partners for a total of eight, plus acted as co-producer for the release. Trucks and Haynes now occupied the twin guitarist’s role and they brought the band into the 21st century. How they are compared to the classic combination of Betts and Duane Allman is up to the listener, but I tend to take them on their own terms, and their quality is very high. All four guitarists made the Rolling Stone Magazine list of the Greatest Guitarists of all Time. While I miss Betts and his country leanings, Trucks brought a bluesy sound to the band which was a nice change. One of the positive attributes was the album was basically recorded live in the studio. There were a few overdubs after the fact, but what they played is basically what you get. There is a lot to like about this album. “Firing Line,” “Maydell,” and “High Cost Of Living” are all very good rock/blues pieces. “Desdemona” at over nine minutes, gives both Trucks and Haynes a chance to provide solos. “Instrumental Illness” was a Haynes/Burbridge instrumental composition, which will always be compared to the Betts catalogue of instrumentals. It was more solo oriented and not as melodic as the Betts material, but did receive two Grammy nominations. At over 12 minutes, both Derek Trucks and Warren Haynes string together a series of solos that are both creative and memorable. Article first published as Music Review: The Allman Brothers – Hittin’ The Note on Blogcritics. Where It All Begins was the third of three comeback studio albums The Allman Brothers released during the first half of the 1990s. While it may be the weakest of the three, it is still a very solid release, as it contains nothing bad but nothing really outstanding as well. Still, it remains very listenable today. The band’s personnel remained intact for the second album in a row. Gregg Allman was getting clean and sober and his performances are some of the album’s highlights. He became more of a presence than he had been in the past. Guitarists Dickey Betts and Warren Haynes were together for their third, and last, studio album. They were the second of three great guitar combinations that would grace The Allman Brothers Band. The rhythm section of bassist Allen Woody and drummers Jaimoe and Butch Trucks was as proficient as ever. Tom Dowd returned to produce his sixth album for the band, which added to its stability. The sound may have been a little more mainstream than in the past, plus the improvisation was less than usual. On the positive side, it was the group’s usual mixture of southern rock and blues. Gregg Allman and Dickey Betts share the principal writing chores. Allman co-wrote four of the tracks and Betts wrote or co-wrote five more. Betts would compose no more songs with another band member, which may have looked ahead to his leaving the band he had been with since its beginnings. “Sailin’ Cross The Devil’s Sea” is an Allman, Haynes, Woody, and Jack Pearson composition and has a nice funky feel to it. It is Dickey Betts’ slide guitar that provides the highlight. “Temptation Is A Gun” was written by Allman, John Friga, and former Journey member Neal Schoen. It contains a wonderful and bluesy vocal by Allman. Dickey Betts goes in a more rock direction than in the past. “Back Where It All Begins” clocks in at over nine minutes, which gives ample time for both Betts and Haynes to weave their guitar magic both by themselves and together. “No One To Run To” and “Mean Woman Blues” may not be the best songs Betts ever wrote, but they have a nice hard edge. Where It All Begins would be a steady seller and eventually receive a gold record sales award. With the release of this album, the Allman Brothers would move confidently into the future. The band would remain a concert attraction as one of the best live bands in the business. Article first published as Music Review: The Allman Brothers – Where It All Begins on Blogcritics. The Allman Brothers had re-established itself as one of the premier American bands with its 1989 comeback tour and excellent 1990 album, Seven Turns. The group quickly went back into the studio and issued a follow-up album during July of 1991. Shades Of Two Worlds was a second very good album in a row. It may not have had the consistency of Seven Turns, but it was more diverse and a solid album in its own right. The band had reduced itself to six members, as second keyboardist Johnny Neel was not asked to return. This meant that Gregg Allman was the sole keyboardist again, and he stepped forward to be one of the keys to the album’s success. It also meant that The Allman Brothers as a group was grounded in a two-guitar sound once more, and the combination of Dickey Betts and Warren Haynes was more than up to the task. They would also combine to co-write four of the eight tracks. The band also asked Tom Dowd to produce the album, marking the sixth time he had served in that capacity. The album was a return to longer tracks, as had been the norm during most of ita early classic period. The best example is the Dickey Betts solo composition, “Nobody Knows.” At over 10 minutes, it is an epic Allman Brothers track. This is one of those occasions where Betts is smart enough to let Gregg Allman provide the lead vocal on one of his songs, and the results are excellent. In many ways, Allman’s vocal work is some of the best of his career. The dual guitars of Betts and Haynes and the drumming of Jaimoe and Butch Trucks are as good as anything the band would produce. Betts and Haynes combined to create another classic Allman Brothers instrumental. “Kind Of Bird,” at over eight minutes is as close to true jazz as the band would come. It seems as if every album would contain a memorable instrumental and this track was no exception as Betts and Haynes were a superb combination. There were a number of other highlights. “End Of The Line” is probably the album’s best known track, as it received considerable mainstream rock airplay in its time. It is a nice rocker written by four of the group members and a good way to begin the album. “Get On With Your Life” is a Gregg Allman composition and he provides another excellent slow blues vocal. “Desert Blues” is a solid blues/rocker with more stellar guitar work from Betts and Haynes. The album ends with a cover of blues legend Robert Johnson’s “Come On In My Kitchen.” Allman’s vocal does Johnson proud and Haynes provides outstanding guitar work. Shades Of Two Worlds was the Allman Brothers’ second superior album in a row. It proved that the band was truly back and in fine form. Another essential release in the long history of one of America’s legendary rock bands. It had been nearly eight years since The Allman Brothers had played together. They reformed during 1989 and promptly embarked on a well received and commercially successful tour. During April of 1990 they went into the studio and six months later released Seven Turns. It would mark the beginning of the third phase of their career, which continues down to the present day. Four original members of the band were joined by three new ones, which made them a seven-man band. Organist/vocalist Gregg Allman, guitarist/vocalist Dickey Betts, and drummers Jaimoe Johanson and Butch Trucks were all back. New members included guitarist Warren Haynes, bassist Allen Woody, and keyboardist Johnny Neel. Haynes would be the key addition as he is now recognized as one of the premier guitarists in the world. He and Betts would quickly become a formidable duo. Not to be overlooked was Neel, as his piano playing complemented Allman and returned the group to the two-keyboardist styling’s of the Chuck Leavell era. The other old friend whose name appears in the album credits was producer Tom Dowd. He produced most of The Allman Brothers best work and has been honored as one of the premier producers and engineers in rock history. Dowd proved to be the final piece of the puzzle as Seven Turns ranks among their best albums. “Good Clean Fun” is the album’s first track and immediately announces that the Allman Brothers are back and in fine form. It is a rocker with Betts and Haynes making their debut as guitar partners, and it is spectacular. Gregg Allman’s voice is in fine form as well and fits the song perfectly. Warren Haynes also proved to be a capable songwriter as he co-wrote several of the better songs. “Gambler’s Roll” is probably the album’s strongest track. It is a haunting song and Haynes was smart enough to allow Gregg Allman to provide the lead vocal. His performance is almost painful as it perfectly captures the essence of the blues. “Shine It On” was written with Betts and goes in a different direction as it returns the band to their southern rock roots. Betts and Haynes also composed another excellent Allman Brothers instrumental. “True Gravity” goes in a jazz direction and while it may not be as well-known as some of Betts’ previous instrumental creations, it remains a fine song in its own right. Another highlight is Betts’ title track; he provides some nice slide guitar on this country/rock tune. Seven Turns was a fine comeback for The Allman Brothers. It would initiate the modern period of their career, which continues today. If you like The Allman Brothers or their brand of rock, you can’t go wrong with this album. You are currently browsing the archives for the Allman Brothers Reviews category.